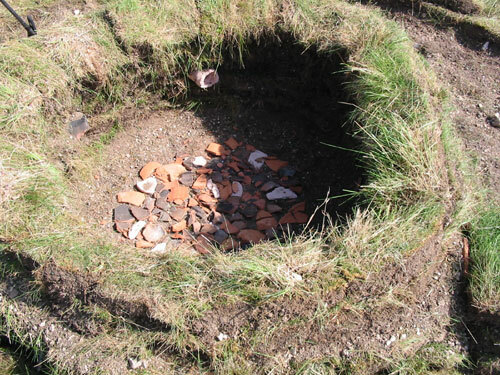 This page is an archive of a firing carried out by Bill Crumbleholme with the assistance of Kate Verkooijen, by kind permission of Martin Green, the farmer. 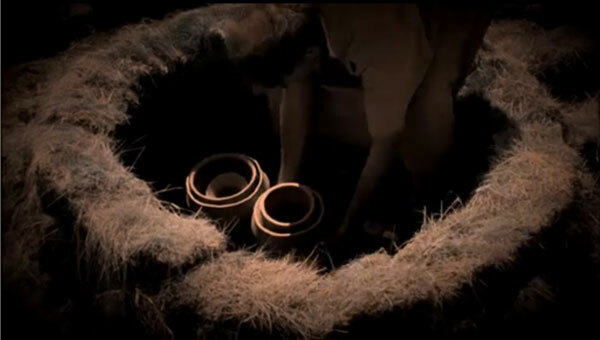 The aim was to fire some replica Bronze Age Urns and Beakers in a turf structure. 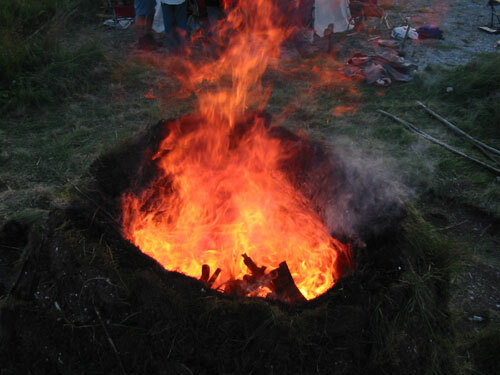 No real evidence has been found to indicate how pottery was fired in ancient times in Britain, so people tend to think that open bonfires must have been used. But a simple clamp or kiln would be an improvement in technology that would have many benefits, but would not leave any evidence behind after the firing. The smelting and melting of copper and tin alloys to form bronze indicates that there was a level of technical knowledge - "Alchemy" - that would have employed simple structures and used forced air draft to increase the temperature of the fire. 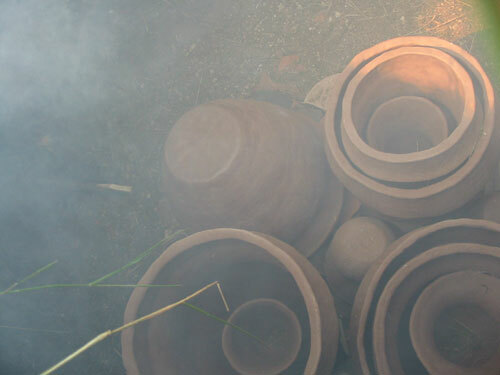 Bill's previous firings had shown that problems lay in several parts of the firing, which needed to be overcome to produce pottery "fit for purpose". This firing was looking at ways of tackling some of those issues. These are the hands of a demented potter, making a beaker! This was taken during filming, but hit the cutting room floor, with most of the rest of the footage. And there was Bill hoping to earn fame and a potential Hollywood career as a corpse. It was hard work not breathing for minutes at a time. But thanks and hats off to the team from Exeter University for their excellent piece of experimental archaeology, which gained good air time and put forward an interesting idea about moving stones. Bill was involved with the Stonehenge Riverside Project, which was the main thrust of the programme, take a look at this link. 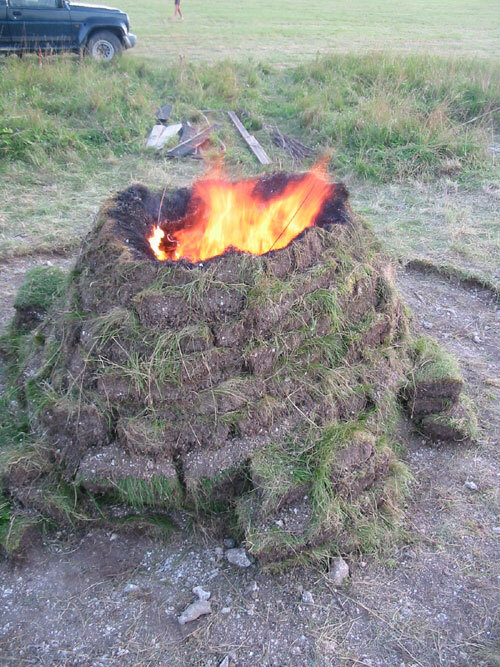 Turf was used as the main building material. It is in abundant supply, stable and easily used without any high technology. 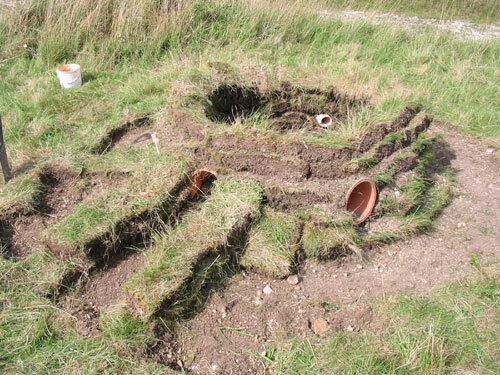 Bill & Kate used metal spades, but animal shoulder blades or horns have been found that would be ideal turfing tools. A circular footprint was used to create a strong shape, concentric rings being better at spreading the stresses evenly, as they sloped inwards the weight produced compression in the ring, which helped to stablise the shape. The "beehive" shaped structure was aiming to be a catenerary curve, a simple but very strong, self-supporting curve, easily produced by dangling a string between two points. Kate cleaning the floor of the kiln, to remove any large chunks of chalk or flint, which might have exploded during the firing. 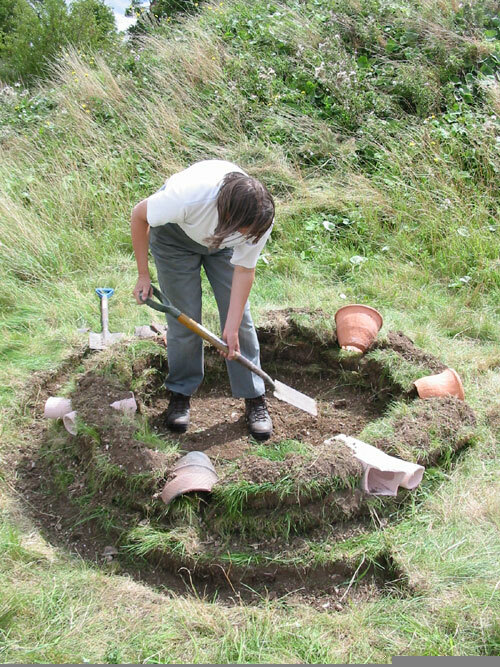 The 1st ring of turf has been laid and a collection of old pots have been inserted for providing a fire box opening and secondary air inlets. These are then buried in the walls as they rise with each subsequent ring of turf. Each ring was pushed inwards slightly to promote the curved shape. Some earth was laid around the outside of the rings, to tilt the turves inward. 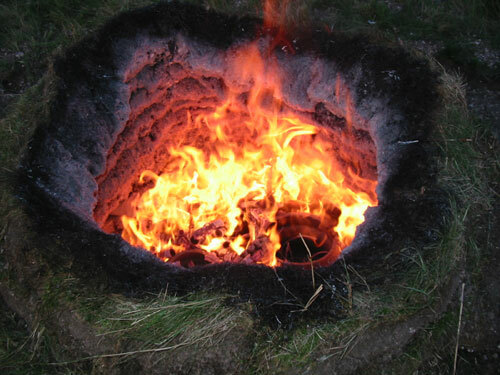 A turf firebox was built, pointing towards the prevailing wind, to funnel the heat from a slow fire through an old pot into the firing chamber. The firebox could be covered over with planks to form a roof or left open if the fire became to fierce at any time. If the wind had died then a funnel shaped extension could have been added to increase the flow of air - to encourage a better burn. On the day the wind was sufficiently strong for this small sized box. That was as far as the construction got on the first day, with all the turf being cut ready for use. These are the vessels ready to fire. Collared Urns, hand built in different sizes so that they stack inside each other. A few beakers - to fill the gaps. 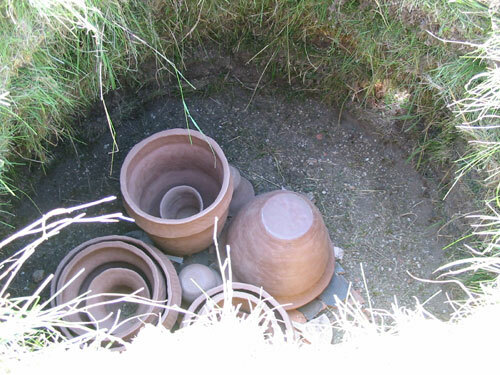 The bottom of the firing chamber was lined with a scattering of broken pottery, to raise the pots off the damp ground and increase the flow of heat under them. The pots were placed in the chamber, in stacks, one upside-down, with the beakers in between. There was a gap all around the pots, for the hot air to circulate and also to enable fuel to be placed there before the last firing stage. 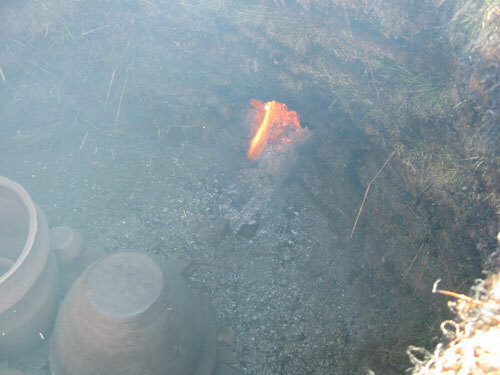 A small fire was started in the firebox and the planks laid to encourage the heat to funnel into the chamber. The heat and smoke perculated into the chamber, gradually warming the vessels - driving off the damp and chemically combined water. Gradually the fire was built up until the flames entered the chamber. 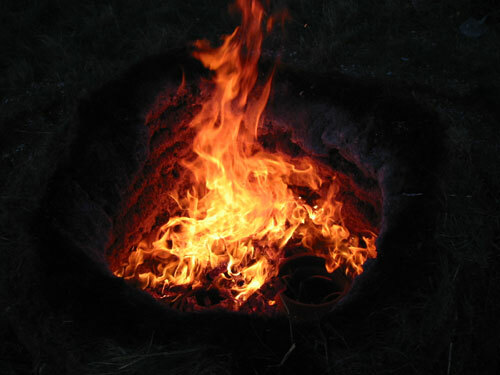 Later on burning embers were pushed into the chamber, around the edges. These were built up all the way round to ensure the pots were well roasted, before the big blaze. 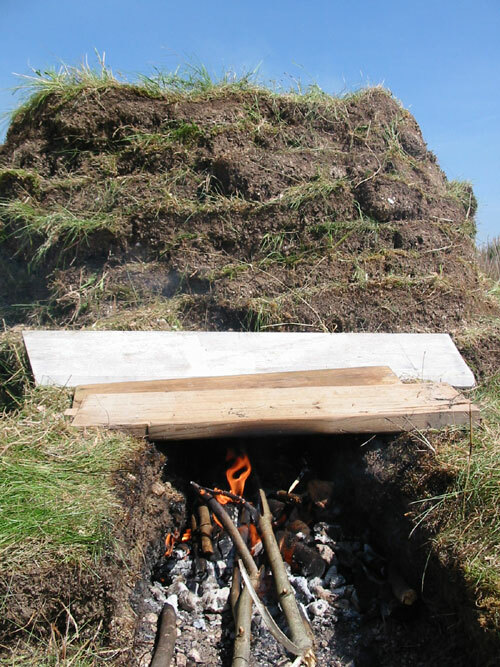 The big blaze was started by letting the embers cool slightly and then stacking sticks of fuel into the chamber over the pots. The sticks were various sizes to create a good blaze. Then a flame was introduced into the firebox again and the fuel burnt with a good blaze. The turf was set alight by the blaze, but was only burnt on the surface, about an inch in. 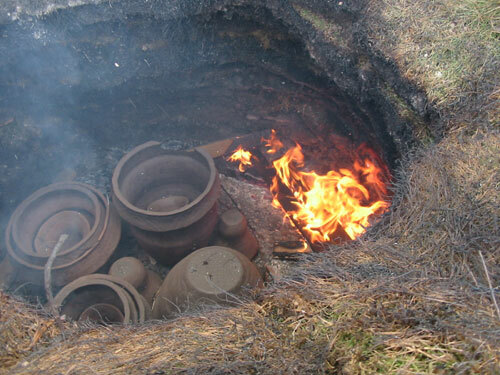 The flames were contained by the turf structure, which improved the efficiency of the fuel useage and kept the heat in contact with the pottery. Flames at the top of the chamber. As the fire died slightly, the embers glowed bright around the pottery. The firebox was left open to provide an air intake for the blazing fuel. The other intakes were left covered - as the air supplied appeared sufficient. When the fire started to burn down, the air intake was sealed up with turf. After the heat had died back, a lid made of woven willow, was placed over the top, to reduce the cooling. 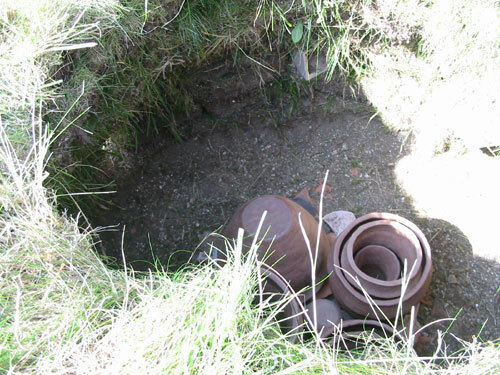 Unfortunately just before that was placed, part of the turf wall collapsed inwards over the pots. It had burnt slightly unevenly and so became unstable and fell in. The kiln was left overnight to cool. Next day the turf was removed and the pottery extracted. Some vessels appeared to have survived intact. 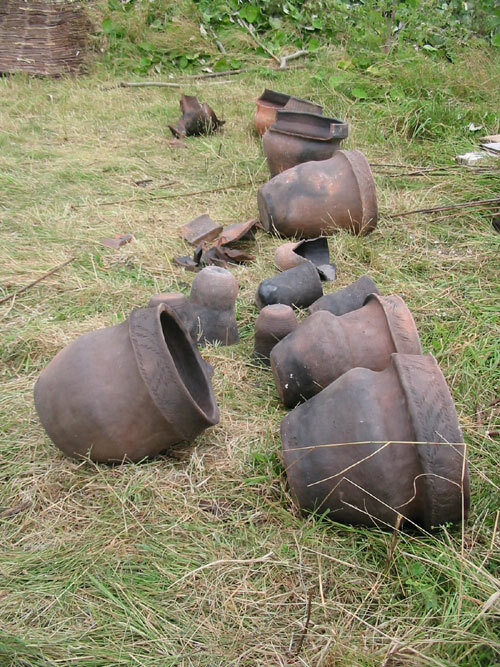 The largest pots all broke, partly because of the kiln collapse. 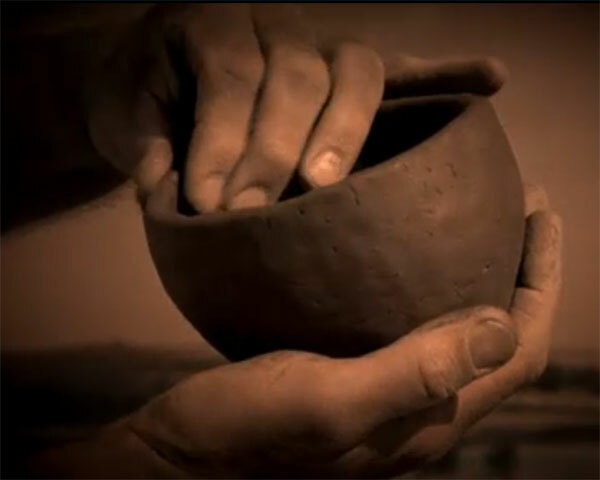 It rained on the exposed vessels shortly afterwards and it became apparent that some of the vessels had not reached a high enough temperature to convert the clay into ceramic, because they cracked and started to turn back into plastic clay. 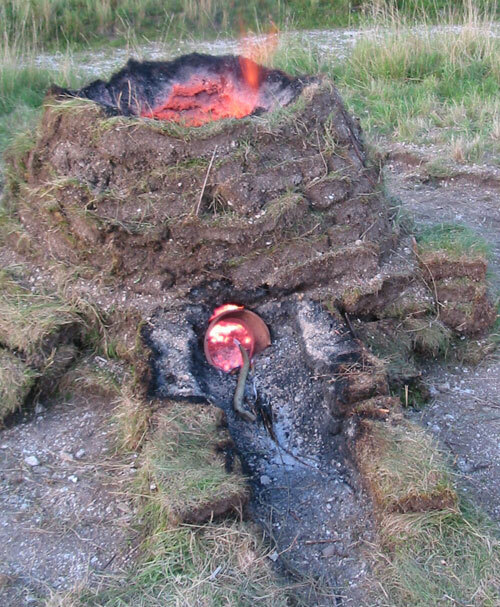 The experiment was a very useful indication that a simple kiln was easy to make and fire. It also left no evidence, after the pots had been removed. 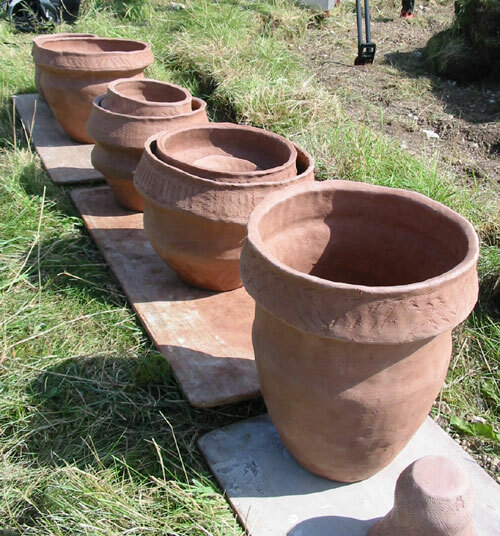 The broken pots were take away to make grog - ground up and recycled into the next batch of clay. 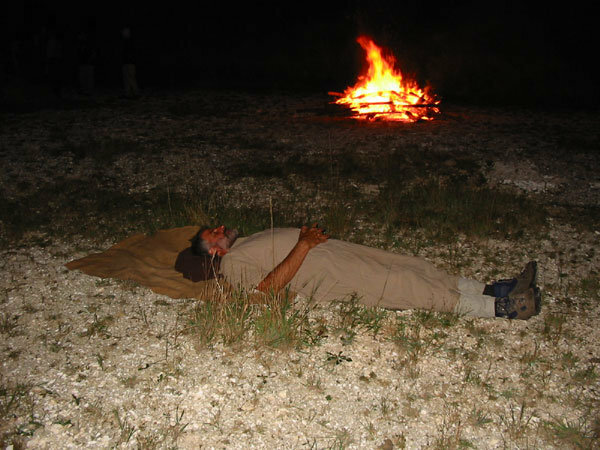 The fire was much easier to control than when using an open bonfire, both when heating up and cooling down. 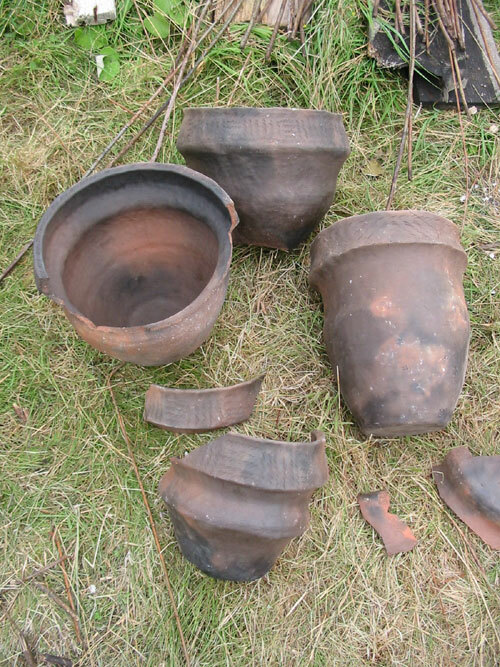 The only pot to break on heating was the tallest collared urn, which suffered from a section of collar breaking off, maybe having been heated too quickly or hit by a piece of timber being moved in the kiln. The rate of cooling was controllable and only one break was seen in a rim after the main blaze. 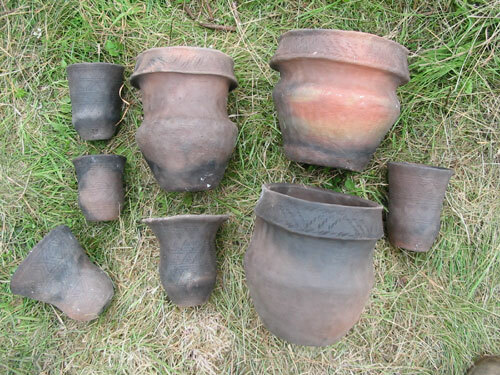 The amount of fuel used for the blaze was not sufficient to heat up all the pottery, so continued stoking should have been carried out - which could have been done, either by putting timbers in from above or by opening up the air holes and using them as stoking fire boxes. 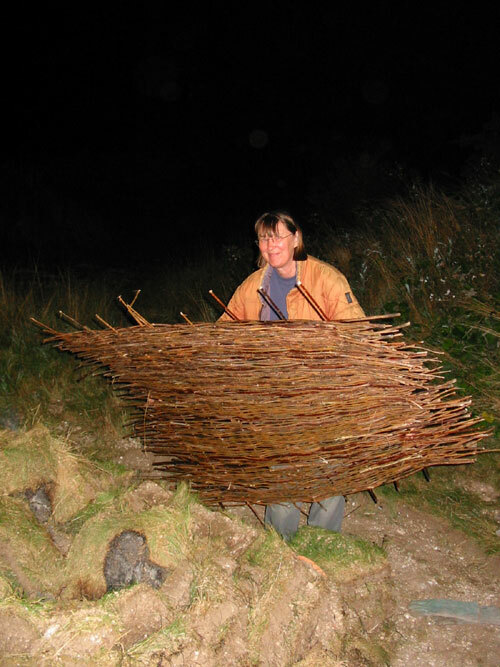 The fuel used was mainly ash branches, with some old building timber from Martin's wood pile. 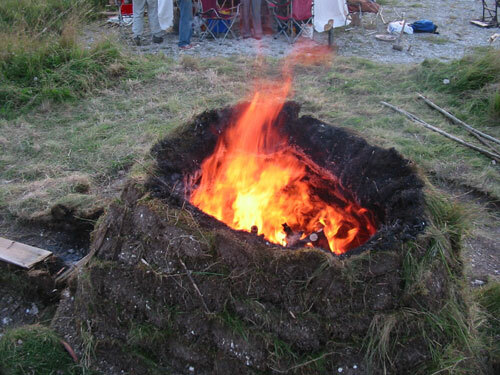 The calorific content of ash is reasonable and the timbers burnt well, leaving only a small amount of ashes, so the fireboxes did not become blocked up. 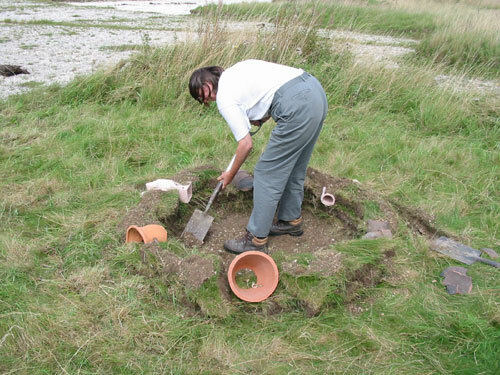 The next firing experiment will follow similar lines, with thicker (more stable) turf walls, with a smaller top hole. It might be set up as a clamp to start with, where the fuel is placed in the chamber over a bed of glowing embers, with the pottery on top of the fuel. The air supply is cut right down and the fuel turns to charcoal as the pots heat up - in a very damp atmosphere. Then the air is allowed in and the charcoal burns and fires the pots. Additional fuel could also be introduced at that stage to increase the temperature. 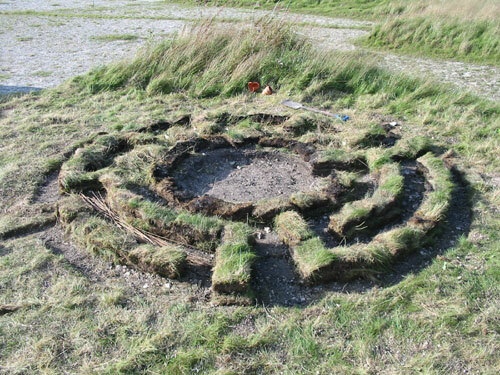 The kiln site was converted into a labyrinth, using the turves stacked in rings to form low walls.